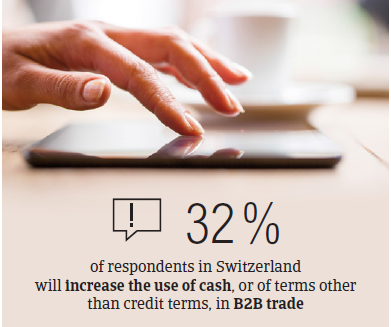 More respondents in Switzerland (32%) than in Western Europe (26%) will increase the use of cash, or of terms other than credit in B2B trade. Along with Austria and Germany, Switzerland shows a quite strong aversion to the use of trade credit in transactions with business-to-business (B2B) customers. 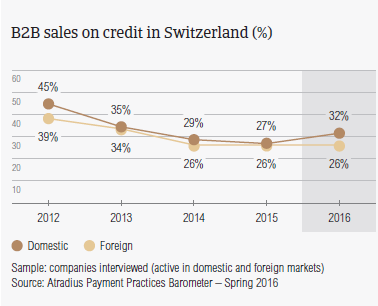 An average of 28.7% of the total value of Swiss respondents’ sales to B2B customers was transacted on credit. This percentage, which is almost the same as that recorded one year ago, is well below the 41.2% average for Western Europe. The aversion to granting trade credit to B2B customers, which is also displayed by respondents in Austria and Germany, may be a reflection of the similarities in the business cultures of these three countries. Respondents in Switzerland appear to be almost equally likely to grant trade credit to domestic and foreign B2B customers. 31.9% and 25.6% of the total value of domestic and foreign B2B sales respectively were transacted on credit (survey averages: 44.8% domestic and 37.7% foreign). As seen in the majority of the countries surveyed in Western Europe, this reflects a substantially uniform perception of payment risk arising from either domestic or foreign B2B trade. 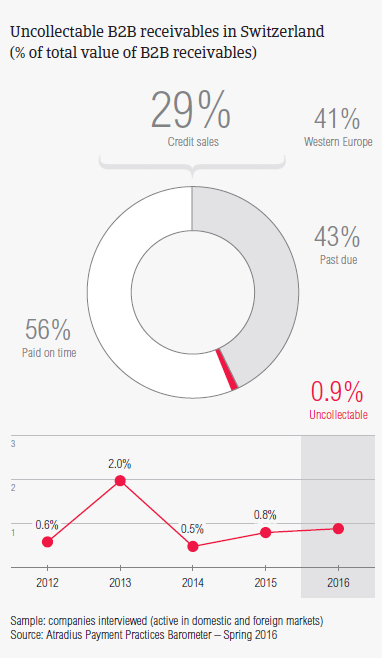 90.5% of respondents in Switzerland experienced late payment of invoices by B2B customers over the past year. This ended in an average of 42.6% of the total value of B2B receivables remaining unpaid at the due date (average for Western Europe: 40%). 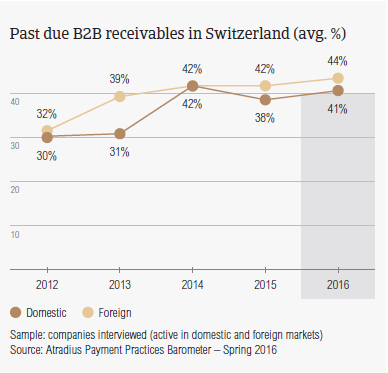 Over the past year, late payment of invoices by domestic and foreign customers of Swiss respondents has increased by an average of 3 percentage points, occurring almost equally often from domestic and from foreign B2B customers. Late payment of invoices (domestic and foreign) is reflected in the Days Sales Outstanding (DSO) figure reported by Swiss respondents. This averages 44 days (four days longer than last year); not far from the 48 days average for Western Europe. 60.7% of Swiss respondents (63.7% in Western Europe) expect no change, in DSO over the next 12 months. 24.2% of respondents expect an increase in DSO over the same time frame (respondents in Western Europe: 22.4%). This may explain why most of the respondents in Switzerland (nearly 22.0%) consider cost containment to be the greatest challenge to profitability in 2016. Respondents in Western Europe: 23.4%. 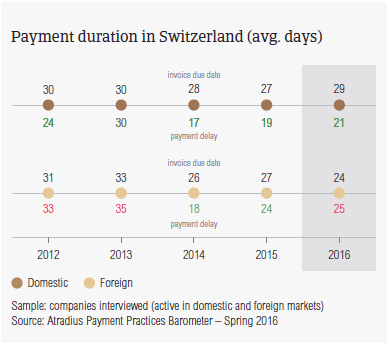 Domestic B2B customers of respondents in Switzerland are extended slightly more relaxed payment terms (averaging 29 days from invoicing) than foreign customers (24 days). These terms are not very far from the 31 days survey average set for domestic and foreign payments. In spite of the similarities between the business cultures of Austria, Germany and Switzerland, when it comes to B2B trade, Switzerland appears to have relatively more lenient payment practices than those observed in the other two countries. Over the past year, domestic payment terms increased by two days, whereas foreign ones decreased by three days. Swiss respondents have to wait an average of three weeks past the due date for overdue invoices to be paid. This is consistent with the average for Western Europe, and has not changed much in the past year. As a consequence, it takes Swiss respondents an average of 50 days from invoicing to turn past due B2B credit sales into cash (survey average: 53 days). Almost the same percentage of Swiss respondents (56.3%) as Western European respondents (57.9%) said that domestic B2B customers pay invoices late most often due to liquidity issues. The intentional use of outstanding invoices by customers for their financial advantage is the second most often reported reason for late payment of invoices on the domestic market (26.7% of respondents in Switzerland, compared to 28.2% in Western Europe). This reason appears to be most often the cause of late payment of invoices from foreign B2B customers. This was cited by more respondents in Switzerland (28.4%) than in Western Europe (25.7%). Foreign payment delay due to the complexity of the payment procedure appears to occur almost equally often (27.3% of Swiss respondents, compared to 28.0% in Western Europe). As a result of late payment, more respondents in Switzerland (around 21.2%) than in Western Europe (18.8%) said they lost revenues. 15.3% of respondents in the country (12.1% in Western Europe) had to delay investment in property, plant and equipment. This is a concern is shared by approximately the same percentage of respondents in Austria and Germany. To protect the business against payment default by B2B customers, more respondents in Switzerland (around 32.0%) than in Western Europe (26.0%) will increase the use of cash, or of terms other than credit terms, in B2B trade. The proportion of B2B receivables reported by Swiss respondents as uncollectable (0.9%) is notably below the 1.3% average for Western Europe. Uncollectable domestic receivables were written off almost as often as foreign ones. Uncollectable domestic B2B receivables originate most often from the construction, consumer durables, business services and services industries. For more respondents in Switzerland (65.2%), than in Western Europe (59.3%), B2B receivables were uncollectable mainly due to the customer being bankrupt or out of business. 27.4% of respondents reported that write-offs were due to the high costs of pursuing the trade debtors (respondents in Western Europe: 25.6%). Swiss respondents reported granting trade credit terms mainly to B2B customers belonging to the construction, consumer durables, business services and services industries. Longer than average (for the country) invoice payment terms are extended to B2B customers in the construction industry (averaging just over one month from invoicing). B2B customers in the business services industry take the longest to pay overdue invoices (on average three weeks past the due date). The consumer durables industry generated an above average (for the country) proportion of overdue invoices. When it comes to the reason for payment delay, half of the respondents in Switzerland said that customers in the consumer durables industry delay payments most often due to liquidity issues. However, those in the construction industry delay invoice payment most often to use outstanding invoices for their financial advantage (52.0% of respondents). Most of the respondents in Switzerland expect payment practices of B2B customers in the business services and services industries to deteriorate over the coming months (around 40.0% of respondents alike). No significant change is anticipated in the payment practices of other industries.